Above, the line chart shows the astounding growth in the number of Adobe Creative Suite subscribers from the launch of CreativeSuite 6 in mid-2012 through March 2014 growing at 31% per quarter to 3.97M in their last quarter. 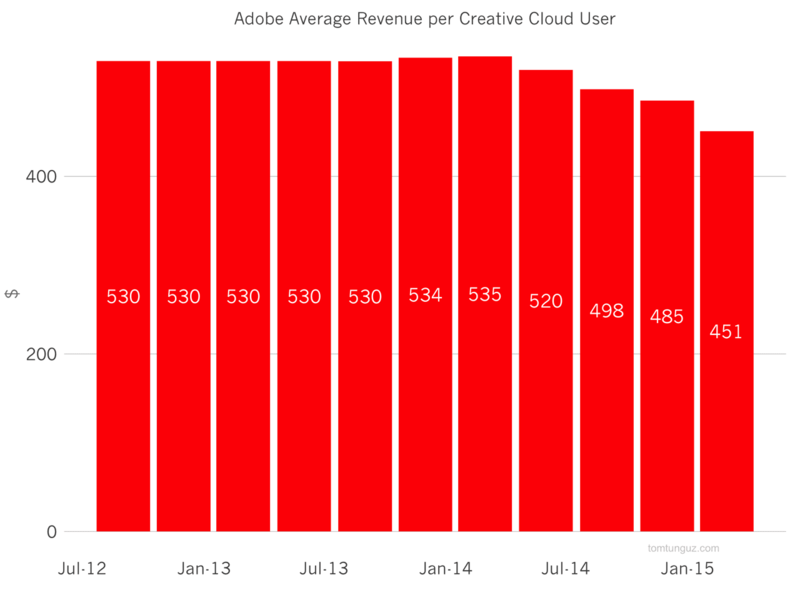 Generating about $4B annually, Adobe is worth $38B and employs more than 12,500 people. And in 2012, the company decided to disrupt its own businesses. The licensed software business, a cash cow, generated more than $3.4B in revenue in 2011 at 97% gross margin. As the plot above shows, the shift to SaaS was immediate in 2012. The company transitioned from packaged software to SaaS for Creative Suite 6, which Photoshop, Illustrator, Indesign, Premier and other content creation software. Only 30 months after launch, subscription revenues have outpaced license revenue at $2.1B and $1.6B respectively. The new SaaS business operates at 93% gross margins. 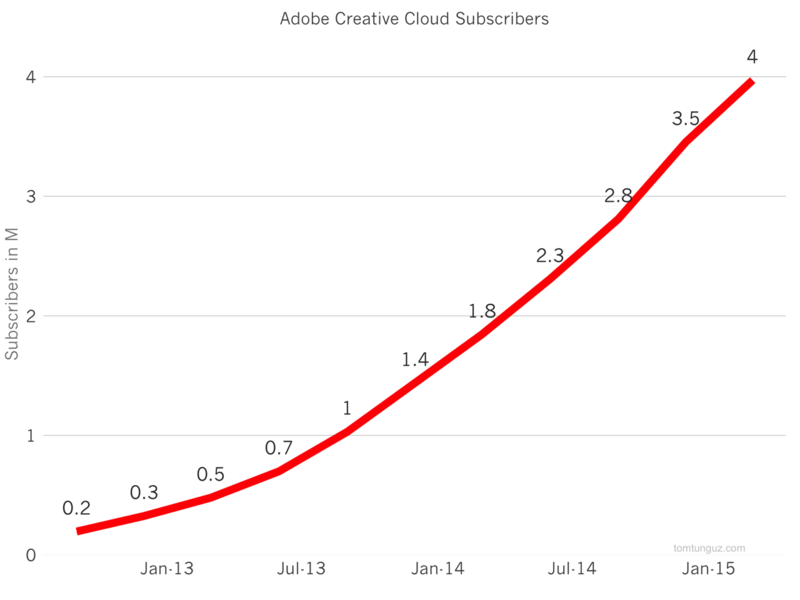 As the number of subscribers has swelled, Adobe has been able to maintain a relatively high average revenue per user (ARPU) of $451 per year or $37 per month in the last quarter. The figure has fallen from the initial price points of $530 dollars, likely from volume discounts and greater penetration in education. The combination of subscriber growth and high ARPU has created a business that has grown from $0.1 to $1.8B in ARR in 11 quarters, implying a 30% compound quarterly growth rate over those 33 months. 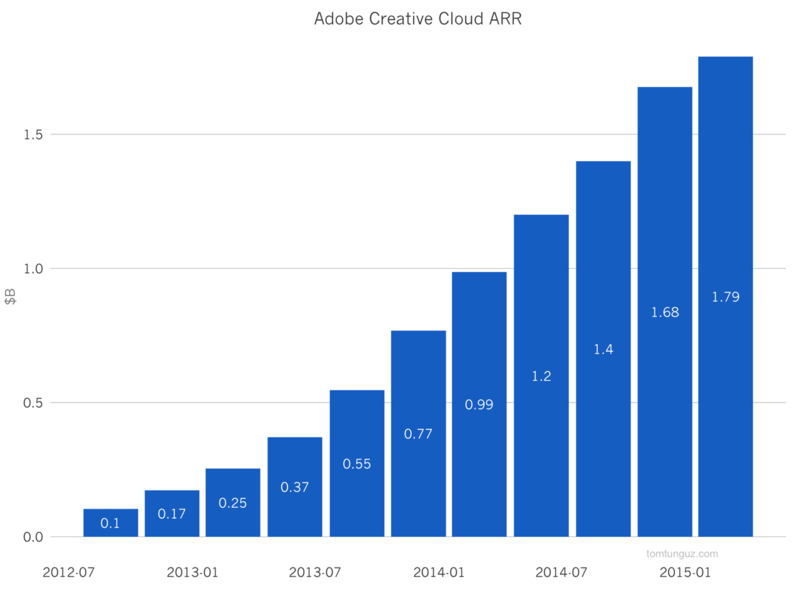 Adobe’s transition to SaaS is enabled by the company’s dominant product line for creative professionals. However, the transition hasn’t produced a meaningful increase in total revenue yet. As the chart above shows, the Digital Media business, the vast majority of which is CS6, has been flat to down for five years. 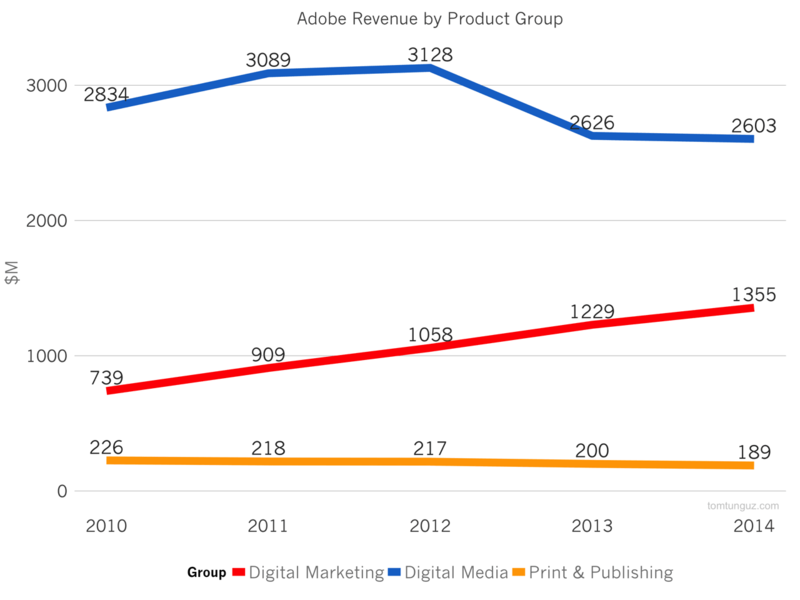 Adobe’s future growth may lie more in it’s marketing software division which has doubled in the same time period and is itself a series of SaaS products. 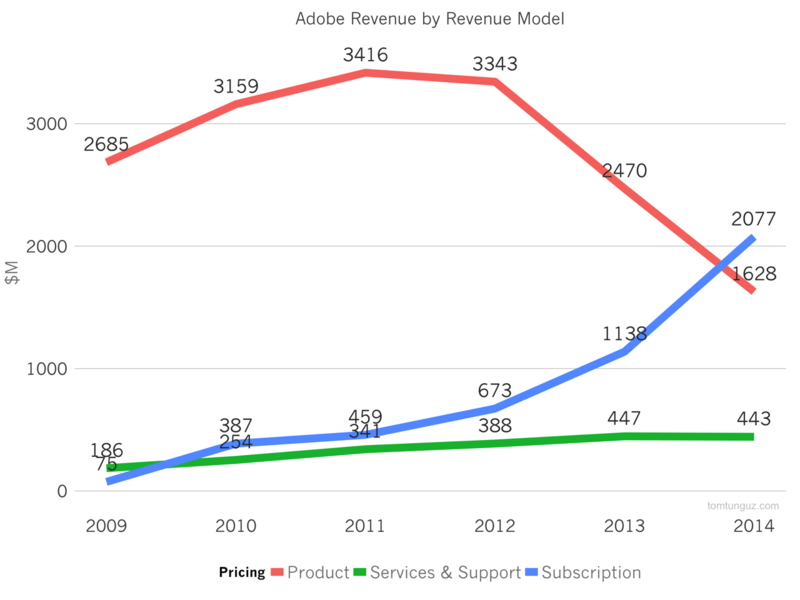 Nevertheless, in just about 5 years, Adobe’s transition from license software to SaaS will be complete, and Adobe will have been one of the few SaaS companies to manage to disrupt itself successfully.